Do you need the best affordable Residential lawn care & Maintenance services in Austin TX for 2019 & surrounding areas? Contact GoMow today & get a quick free quote.g Lawn Maintenance and Lawn care service plan in Austin today! Visit our website or call us at 800-601-0669. Residential Lawn Mowing in Austin, "You Click,We Cut"
Are you searching for the best and top-rated lawn care service near you in Austin, TX areas? GoMow is the perfect answer for your lawn care. GoMow offers an affordable lawn mowing and lawn care services to Austin residents. Click here gomow.com to get a FREE QUOTE and select from one of the many different lawn care service plans available to the residents of Austin, TX and have GoMow maintain your lawn Today! As you might know, the Keep Austin Weird theme is the cities slogan and the unique soil topology of Austin is no exception. Lawn Care in Austin is especially difficult if you live in West Austin, which commonly has turf areas made up of mainly shallow black soil on top of limestone. This diverse combination makes growing vegetation uniformly quite a challenge. In East Austin, the turf areas are composed of mainly black clay and often have Chinch bugs which attack primarily St. Augustine grass. These pests cause uneven brown patches on your Lawn. These special combinations of soil make Lawn Maintenance in Austin unique. Don’t miss in 2019. 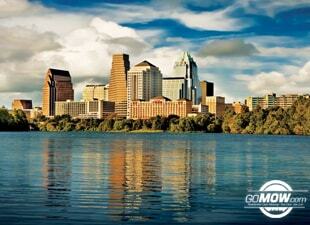 GoMow offers one of the most professional lawn mowing services in Austin TX. Avoid having an unhealthy lawn this year and contact GoMow to help you get set up on an ongoing Lawn Maintenance and Lawn Treatment service plan in Austin today! Don’t wait. Call now 512-354-1155. Pricing ranges from $23 for small/zero-lot-line yards to over $50 for large home lots. Ready to have your lawn maintenanced by GoMow? Don’t hesitate to contact us today or simply add the desired service plan to your shopping cart and complete the order online! We have been using GoMow.com services for 2 months now. I'm really impressed! The customer service has been the best part. They set expectations well and clearly communicate what they can do and what they can't do. They also have a great website that allows you to change your account information, request specific services, and verify your next appointment. Likewise, the actual lawn care has been top notch. It's great knowing that you are going to come home to a freshly mowed and trimmed lawn with no drama. GoMow.com has been my lawn service for several years. They are dependable and take care of my yard even the certain items that I have requested with a very nice business like attitude. I would certainly recommend their services. I have been using GoMow.com for a couple of years and their service is great! I love coming home on the day my yard has been mowed. Their service makes it easy, no worries about leaving a check for someone. Love it. I even use their bed crew to clean out my flower beds and remove leaves, etc.… once a year. Easy, reliable and dependable. Give them a try! I use Gomow.com twice a month and love the ease of the service!!! They do a great job consistently and I highly recommend them!! !